The world-renowned Arizona-Sonora Desert Museum combines a zoo, natural history museum, and botanical garden, all in one facility. Founded in 1952, the museum is dedicated to the conservation of the Sonoran Desert which reaches from northern Mexico into southern Arizona. Its exhibits are almost entirely representative of this region. The museum's stated mission is "to inspire people to live in harmony with the natural world by fostering love, appreciation, and understanding of the Sonoran Desert." 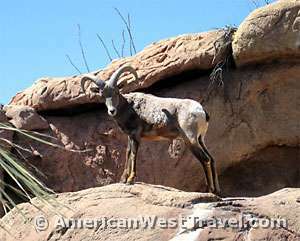 The Arizona-Sonora Desert Museum is located east of Tucson in an area known as the Tucson Mountain Park. The museums's 21 acres is largely located on a bajada (sloped outwash plain) at the base of the Tucson Mountains. 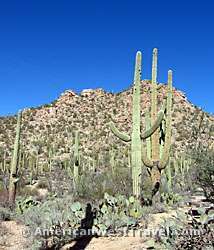 The bajada creates a lush environment for natural desert vegetation, most notably the saguaro cactus forest (photo, right). Vistas to the north and east feature the Tucson Mountains which reach a height of 4,687 feet at Wasson Peak in adjacent Saguaro National Park. To the south is the broad expanse of the Avra Valley. The museum exhibits plants, animals, fossils, and minerals of the Sonoran Desert region. The focus is on making maximum use of the natural surroundings. The lengthy Desert Loop Trail passes through unspoiled desert south of the main loop. A herd of javalinas may be observed here in their natural environment. there is an interpretive exhibit of an agave field once cultivated by the ancient Hohokam people. Many exhibits simulate natural habitats found in varying Sonoran Desert environments. For example, the Mountain Woodland section features plants and animals found at elevations of about 4,500 to 7,000 feet. These elevations occur on or near "sky islands" which rise out of the desert and feature scrub oak, juniper and pinyon trees instead of cactus. The Santa Catalina Mountains north of Tucson reach a peak of 9,157 feet at Mt. Lemmon where skiing is often available in the winter. Many of the desert's larger animals favor the mountain woodland region. Those exhibited at the museum include mountain lions (photo, left), black bear, white-tailed deer, and the exceedingly rare and endangered Mexican Wolf. These animals are exhibited in large and very beautiful natural settings. The Riparian Corridor simulates the lush streamside regions of the Sonoran Desert. These are generally washes or valleys which contain a running stream all year round or for part of the year. If there is enough water, small ponds or lakes may occur. Here at the museum the permanent ponds house fish native to Arizona as well as beavers, otters, and coati. The simulated steep rocky hillside above the pond is home to a group of agile bighorn sheep (photo, right). The exhibit also includes an underground viewing gallery which features an underwater view into the ponds. 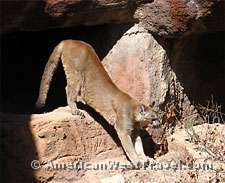 Nearby Cat Canyon features several small cats of the Sonoran Desert. The bobcat is quite commonly found in Arizona while the ocelot is more common to Mexico. The exhibit also houses a gray fox. Beyond Riparian Corridor, the Walk-in Aviary (below, left) offers a peaceful and shady respite. The aviary features roughly forty species of smaller birds found in the desert, including cardinals, Gambel's quail, ducks, doves, humingbirds (there is also a separate hummingbird aviary), cactus wrens and gila woodpeckers. Numerous benches are provided where you can take a break under the trees and enjoy the numerous small birds. The museum's collections include about twenty endangered or threatened species and many more rare species. It is involved in various recovery programs and research for some of the endangered plant and animal species, in particular the Mexican gray wolf, the thick-billed parrot, and several amphibians. The museum also participates in some captive breeding programs where rare animals may be returned to the wild. Beside the natural vegetation, desert plants are also featured in several landscaped gardens. These include the Cactus Garden which has over 100 species of cacti and other desert plants; the demonstration Desert Garden which sows how desert plants can be used in home landscaping; and the Pollination Gardens which demonstrate the relation between wild and food plants and animal pollinators such as hummingbirds, bees, butterflies, and moths. The Earth Sciences Center relates some of the Sonoran Desert's natural history. Access is by way of a simulated underground limestone cave. The highlight is a beautiful, large decorated room full of stalagmites, stalactites, and other formations. This simulated, decorated room (photo, right) is an impressive depiction of a limestone cave. However it doesn't approach the natural beauty of a real limestone cave. 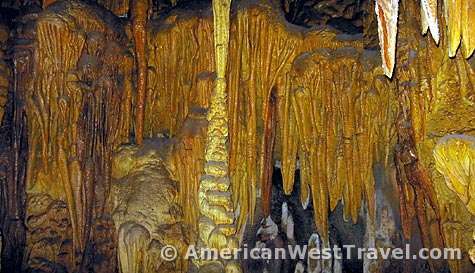 You can observe a real limestone cavern at Kartchner Caverns State Park. The park is located near the town of Benson, about a one hour drive from Tucson. The simulated cave also features a "true caving experience" which is popular with kids. It is an optional 75 foot trail with low ceilings, rough footing, and (very) tight passages. Beyond the cave, the Earth Science Center offers an exhibit tracing the natural history of the earth from creation to the present day, with the focus on the Sonoran Desert region. The second room house an outstanding collection of regional minerals and gemstones. Back outside, the Ancient Arizona exhibit features simulated fossils from Arizona's distant past. The focus is on dinosaur fossils and palaeontology. 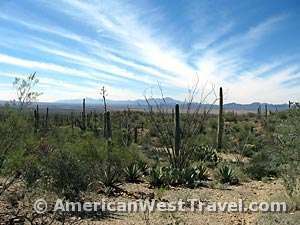 The Arizona-Sonora Desert Museum is about ten miles west of Tucson, Arizona. Take the Speedway Boulevard exit off on I-10 in downtown Tucson. The road becomes Gates Pass Road as you head west. (The twisting scenic road is not suitable for large RVs which should take Arizona-86 from I-19, then right on Kinney Road.) Attractions along the way include the International Wildlife Museum and the Old Tucson Studios. Years ago, Old Tucson was an active movie set but is now a popular "old west" entertainment park. From Gates Pass Road, turn right on Kinney Road. For more information, visit the Arizona-Sonora Desert Museum website, or call 520-883-2702. Saguaro National Park (photo, left) is located adjacent to the museum, on the north side of Kinney Road. There is a trailhead accessing the park's excellent network of trails right across the street from the museum's parking lot. The park's visitor center is about three miles west on Kinney Road. There is camping available at the Gilbert Ray Campground. Turn off of Kinney Road about a half mile west of Old Tucson Studios onto McCain Loop Road. 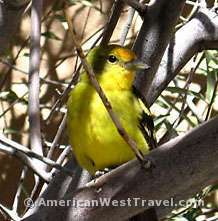 The Arizona-Sonora Desert Museum is about ten miles west of Tucson, Arizona. Take the Speedway Boulevard exit off on I-10 in downtown Tucson. The road becomes Gates Pass Road as you head west. The twisting scenic road is not suitable for large RVs or trailers which should take Arizona-86 from I-19, then right on Kinney Road.